The glittering technological future we were all promised has turned into a dystopian nightmare. If music must reflect the times, the hour has plainly come to reject the mainstream status quo and get down to the roots and rhythms of life's elemental heaviness. 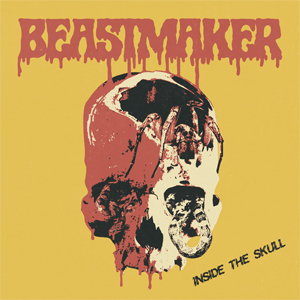 And that's where BEASTMAKER comes in. Purveyors of some of the most ecstatically thunderous and raw doom metal to emerge in decades, this three-man riffing machine from Fresno, California, are manifestly the real deal. Their sound is instantly recognizable and yet thrillingly otherworldly, like all your favorite riffs fed through some perverse malevolent prism and reborn in fresh, overdriven grotesquery. But while they may superficially appear to servants of a strict Sabbathian code, there is plenty of room for maneuver within the band's titanic sound. The result of this feverish desire to expand their sonic universe is new album Inside The Skull, a bruising tour-de-force of sinister riffs, skewed blues and looming horror, it is simply one of the heaviest and most mesmerizing albums you will hear in 2017, replete with a special cameo or two. Inside The Skull is set for release May 19th via Rise Above Records. Today the artwork and track listing have been revealed. From the old school evangelism of opener "Evil One" and the warped psychedelia of "Now Howls The Beast" through to the twisted fury and fire of "Psychic Visions" and creepy closer "Sick Sick Demon", Inside The Skull is not just a muscular hymn to the glory days of heavy metal's genesis and early prosperity: this is a vital, virile and venomous slab of wildly creative but spiritually pure doom devastation, designed to rescue us from the drab harshness of present day reality and transport us somewhere cooler, somewhere better and, in the best way possible, somewhere much heavier. Recorded and produced by the band themselves, in their own self-built studio, it's an album with great depths and a macabre heart. While they may be reveling in Hitchcockian disquiet, BEASTMAKER will not be lurking anonymously in the shadows for long. Once Inside The Skull is released, the band will be hitting the road in the US with Zakk Wylde's BLACK SABBATH tribute act, ZAKK SABBATH, before the band's campaign to draw the world into this unique maelstrom of pitch-black riffs and morbid tales begins in earnest. Erupting from the underground, this beast is alive and ready to howl.